In March 2017 I wrote a blog post highlighting the fact that the Tories were openly admitting that they had done absolutely no impact assessments into the social and economic effects of a "no deal" cliff edge Brexit before they decided to make the threat of it the absolute centrepiece of their so-called negotiation position with their "no deal is better than a bad deal" rhetoric. By the summer the Tories and the Brexit minister David Davis had changed their tune completely. Davis took to claiming that there were between 50 and 60 detailed sectoral analyses into the economic impact of Brexit. When quizzed about whether Theresa May had read these Brexit impact assessments by the Brexit Select Committee, David Davis claimed that they contained "excruciating detail", but that she would have read the executive summaries. In early November the opposition parties won a vote to force the Tories to hand over the Brexit impact assessments to the Brexit Select Committee so that they could scrutinise the different impacts of the various different Brexit scenarios. Since then the Tory government have been stalling and stalling on handing over these impact assessments, despite being threatened with contempt of parliament by the speaker John Bercow if they don't. And then on the morning of December 6th 2017 David Davis decided to tell the Brexit Select Committee that there are actually no Brexit impact assessments on any sector of the UK economy. This clip is extraordinarily difficult to square with Davis' previous assertions that Theresa May had read the executive summaries of these excruciatingly detailed reports that don't exist. 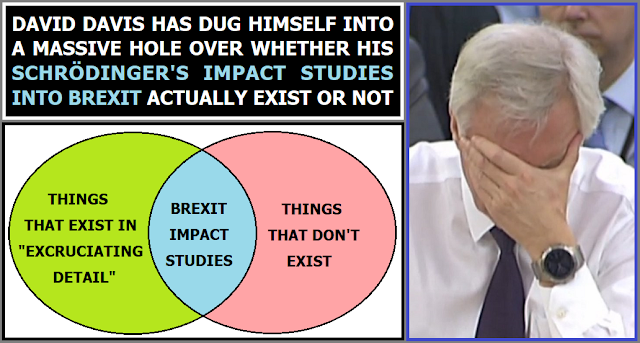 It makes an interesting though experiment to consider the nature of these Schrödinger's impact assessments which both exist in excruciating detail and also don't exist at all according to David Davis, but the bigger issue here is that the man has clearly exposed himself as a profoundly dishonest charlatan. He was either lying when he claimed that Theresa May has read the executive summaries of these reports, or he's lying that they don't exist simply because he doesn't want anyone to read them because they project a catastrophic economic meltdown if Brexit goes ahead. Brexit is the single most complex and risky process the UK has undertaken in decades, and David Davis is now expecting us to believe that the Tories have done no research into the potential consequences whatever. He expects us to just accept that they've wasted 18 months since the EU referendum result on a shambolic "let's make it up as we go along" Brexit strategy, without even considering the economic impact of what they're actually doing. This admission from David Davis should be the final nail in the coffin for the myth of Tory economic competence. Let's forget the fact that those who propagandised in favour of Brexit should have presented social and economic impact studies before the EU referendum to convince us of their case, and just focus on the fact that even after Brexit they've had 18 months to research the consequences of their actions, and they've done nothing. How can they ever pretend to be competent guardians of the British economy again when they're now admitting that they've spent 18 months on Brexit without doing a single study into the impact on any area of the UK economy (the financial sector, aviation, the automotive industry, manufacturing, agriculture, retail, the health service, fishing, hospitality, tourism, any of it!)? Millions of people ignored the fact that the Brexiteers had no plan and no impact studies to justify their case and voted in favour of Brexit regardless, but surely now they must be having second thoughts given the fact that the Tories have openly admitted wasting 18 months, and even triggering Article 50 without even bothering to do any analysis on the possible consequences beforehand. How can anyone, no matter what their views on EU membership, look at this extraordinarily reckless Tory shambles and not be deeply concerned about it?